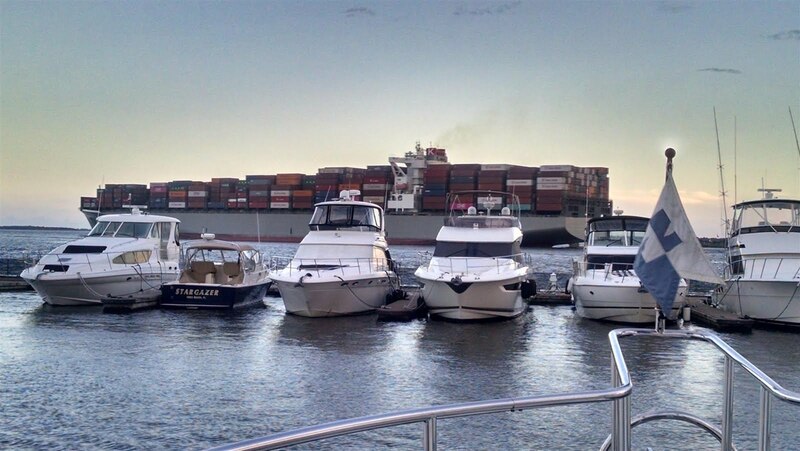 Getting Ready to Depart Charleston....the Harbor is a Busy Place. The morning of Sunday, 05-August dawned with clear skies and nearly calm winds, and while the forecast called for a chance of thunderstorms during the day, it was much less onerous than what we had been seeing the previous 10 days. 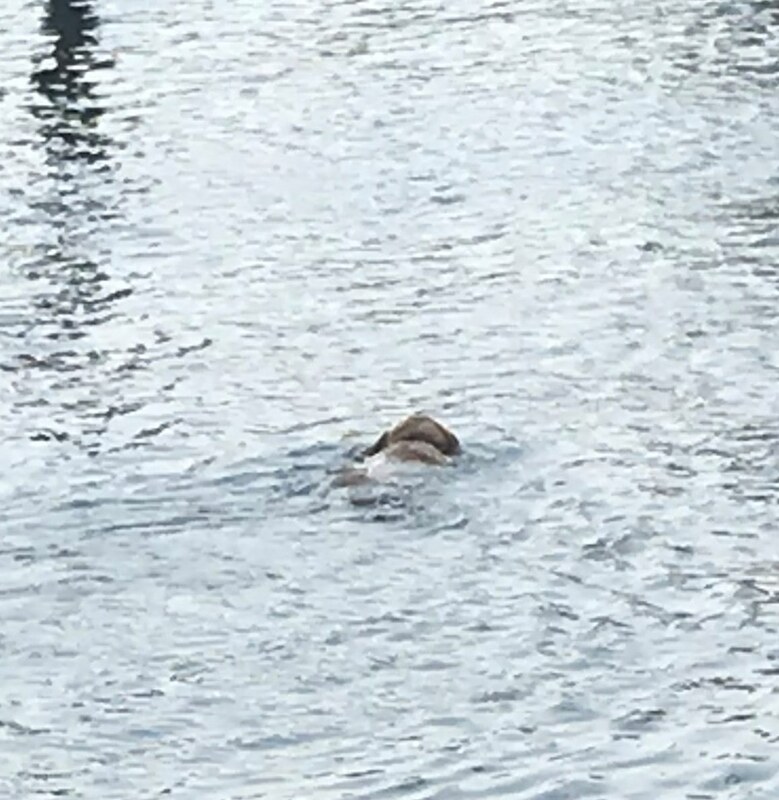 So just after 0915 we departed Charleston Harbor Marina at a nearly slack tide and steered Ghost Rider back out into the Atlantic. Out there seas were smooth with two foot swells at generous intervals and little to no wind chop, so the ride was excellent. 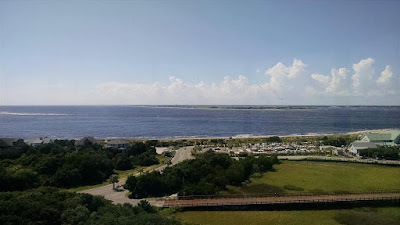 During the course of the day we could see some cumulonimbus lines form just inland along the sea breeze boundary, but their movement paralleled our course and had died out by the time we turned into the channel for Winyah Bay and the Georgetown Light anchorage. At Anchor Near Georgetown Light Just After Sunset. Arriving at a mostly slack tide was fortuitous, but we still got frustrated trying to set the anchor in the river’s muddy bottom behind North Island. After two failed attempts we gave up and moved about two miles further upriver just north of Cat Island where we finally got the hook to take a good grip in the muddy bottom. We thoroughly tested the bite; the current here runs several knots at peak tides….to the point that the main engine’s propeller and shaft were actually windmilling while at anchor during most of the evening’s outgoing tide. The flies here at this time of year are large and aggressive with a stinging bite, so we wasted no time in cranking up the genset, closing up the boat and getting the A/C going. We had a peaceful night. with Wind and Current on the Beam. 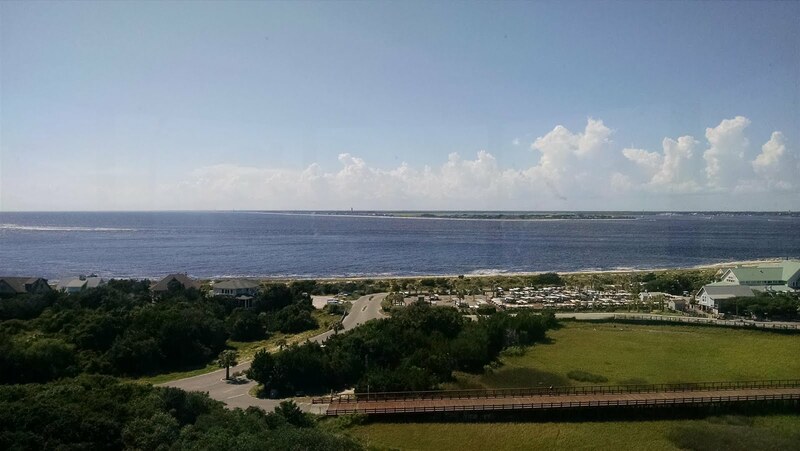 Monday, 06-August greeted us with sunny skies, a light breeze and the same ripping current. But the anchor had stayed right where we had dropped it. The only other remarkable thing was the number of dead bugs on the boat decks – we were really glad we had closed up. 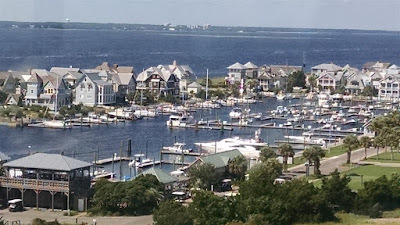 We got an early start (for us) since we had a lengthy run of nearly 80 nautical miles up to Cape Fear and the Bald Head Island Marina. At 0745 we retrieved the hook and shortly thereafter found ourselves doing over 11 knots on the outgoing tide. Sea conditions on the outside were once again quite pleasant with two foot swells at comfortable intervals and just a slight wind chop in the southeast breezes. Bald Head Marina is a Picturesque Place. Eventually we lost the benefit of the tailwind current and settled into an easy cruise speed of between 7.5 and 8.0 knots. We arrived at the head of the Cape Fear River channel around 1700 and made our way to the narrow entrance of the Bald Head Marina by 1730. A moderate sized thunderstorm had parked itself over the island earlier in the day, but by the time we arrived it had rained itself out. It was after hours at the marina with no dock hands available, but – after waiting on the large ferry boat that did not seem to care about right-of-way rules – the tie-up on the assigned t-head was straightforward. We got the boat and ourselves washed down, then settled in for a comfortable evening. Ghost Rider Tucked in at Bald Head Marina. 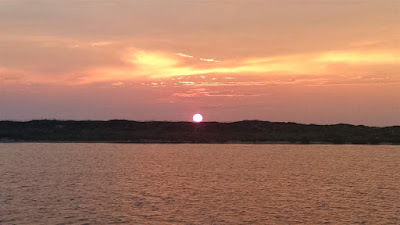 On Tuesday, 07-August we slept in a bit and enjoyed a lazy morning at the BHI docks and tended to some standard Wheelhouse recurring maintenance items. The marina is picturesque, with generous spaces and solid 240V/50A power at the floating docks, and is located within an enclosed and well protected basin. It is a bit shallow, though – we saw less than a foot below the keel at low tide; anything bigger than a Nordhavn 47/50 probably couldn’t fit in here. That afternoon we rented a golf cart and toured the accessible portions of the island, which can only reached by boat (the ferry runs at half hour intervals) and is a cart-only community, with less than 200 permanent year-round residents. That population, however, blooms to around 10,000 during season. 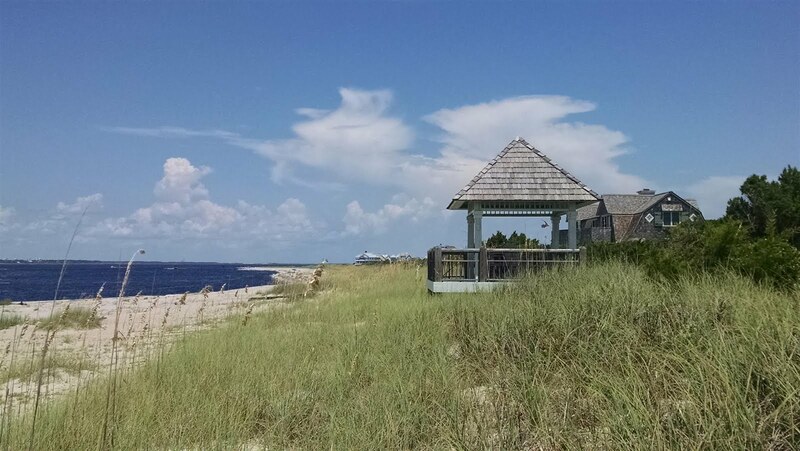 Today this barrier island is noted for its beaches, prim cottages, vast marshlands, and as a beach sanctuary for nesting sea turtles. And while its notoriety does not rival Charleston’s in the history books, it still has some interesting stories to tell. 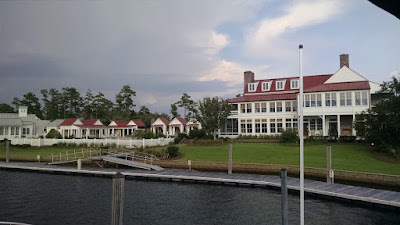 Beach Cottages on Bald Head Island. Like most of this part of the U.S. coastline, its original native inhabitants were chased away or victimized by imported diseases, beginning with the Spanish in the 1500’s. We owe the Spaniards for “discovering” the nasty shoals that extend far into the Atlantic, where they managed to shipwreck numerous vessels. By the time the Brits gained control a century later they apparently had not learned much from those previous sailing adventures, as they also lost their fair share of ships in the same (“Frying Pan”) shoals. Indeed, in what’s known as the “Battle of the Sandbars” circa 1718, the British sailed a warship from Charleston to chase one of the many pirate ships plying these waters, and both went aground during the battle; suffice it to say the first one to float off at a higher tide (the Brits) beat the hell out of the other (pirate) ship and its captain was hanged here shortly thereafter. 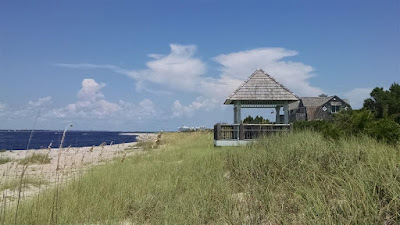 Beach on the East Side of Bald Head Island. The area became a naval focus again during the U.S. Revolutionary and Civil Wars, if only briefly, and then again during World War II – it was always a key supply port, and the extensive offshore shallows caused many allied merchant ships to run much further off the coast where German U-Boats picked them off with ease in the early years of that conflict. So it’s not a stretch to say the name “Cape Fear” has all sorts of relevance. 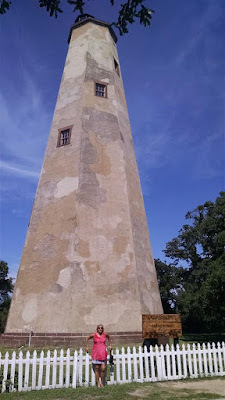 We spent several hours touring the south (inhabited) end of the island, stopping for lunch at a snack bar in one of the shopping squares along the way, and climbed the 108 steps to the top of the Old Baldy lighthouse for some excellent views of the local landscape. We concluded the day with a late shrimp dinner on the patio deck of Mojo's, one of the three restaurants on the marina premises – the service and food were quite good, although we still make better rum drinks on Ghost Rider. 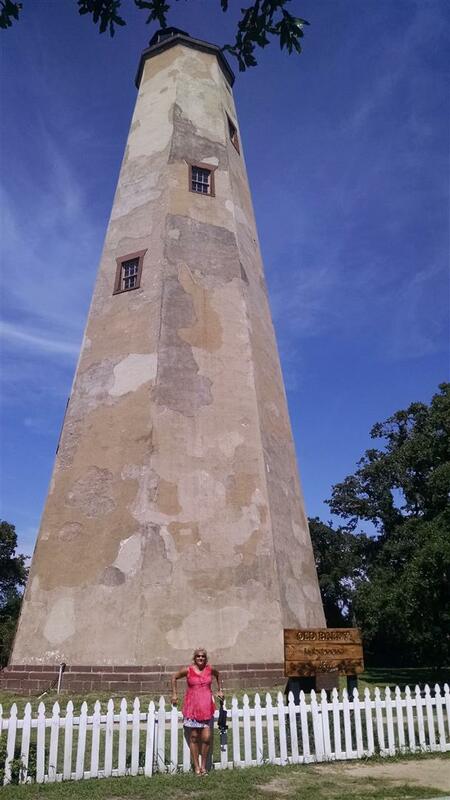 Rick Posing at the Foot of the Old Baldy Lighthouse Placard. Chelle and the Old Baldy Lighthouse. 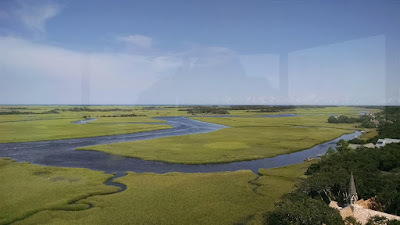 View of the Island's Marsh Country from the Lighthouse. Center of the Photo at the End of the First Long Dock. We decided to stay another day since the weather forecast and tidal currents would be slightly in our favor with that approach, so Wednesday, 08-August was more relaxing downtime at BHM. Chelle spent the morning cleaning fly bridge cushions and hanging her veggie net, while Rick attacked some more exterior fiberglass stains and topped off the water tanks. Chelle wanted to rent a kayak in the afternoon but missed the timing a bit – turns out they only allow launching those here at certain tides. After that we just relaxed and caught up on email and news, updated the latest blog notes, and got the boat preflighted for the planned departure the next morning. On Thursday, 09-August we set an alarm so we could depart at a reasonably high tide and tolerable current flow, and just after 0800, after waiting for the two ferries to make their turn and exit through the narrow marina channel, we pushed away from the dock. The winds were blowing at 20 knots out of the southwest with higher gusts and smashing into outgoing current – and that made the wide river basin a boiling, whitecapped mess. We were soon taking spray up to the fly bridge. 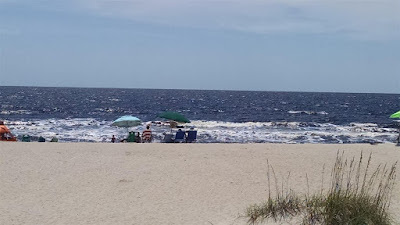 The sea forecast had called for two to three feet, but we were seeing frequent five and six footers as Ghost Rider traversed the Cape Fear channel towards the open Atlantic. 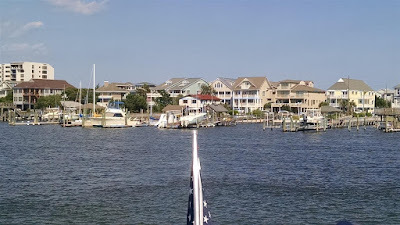 Approaching the Masonboro / Wrightsville Beach Anchorage. Unfortunately the river channel took us nearly due south, bashing into those head seas for nearly 15 miles, before we could clear Frying Pan Shoals and make our turn to the north. After that turn the ride was considerably better, and after escaping the counter current an hour or so after that, the seas improved to the forecast heights. The final three hours of the journey were relatively smooth and we saw no threatening storms the entire day. We entered the Masonboro Inlet just before 1500 and made our way west and then north to tuck in behind Wrightsville Beach. We dropped the hook in ten feet of water, although it took two attempts to get it set firmly. But by 1600 we were secured with genset running and the air conditioning cooling us off nicely in the “feels like” 100F heat. We retrieved the anchor got back underway around 0845 the morning of Friday, 10-August, pointing Ghost Rider back out into the Atlantic for the leg to Cape Lookout. We had clear skies, light winds and a relatively smooth ocean – initially just two-to-three foot rollers from the south at reasonable intervals. All of that was right in line with the forecast. Later in the afternoon the rollers grew to four-to-five feet, but at six second intervals and quartering off the stern, so the ride was still quite tolerable even if the autopilot occasionally struggled with a steady heading. We covered the 73 nautical mile trek in less than 10 hours, and by 1830 we had maneuvered inside Cape Lookout’s well protected basin and had the anchor firmly set in 25 feet of water. We enjoyed drinks and sunset on the fly bridge, followed by a scrumptious shrimp jambalaya dinner, then called it a day. 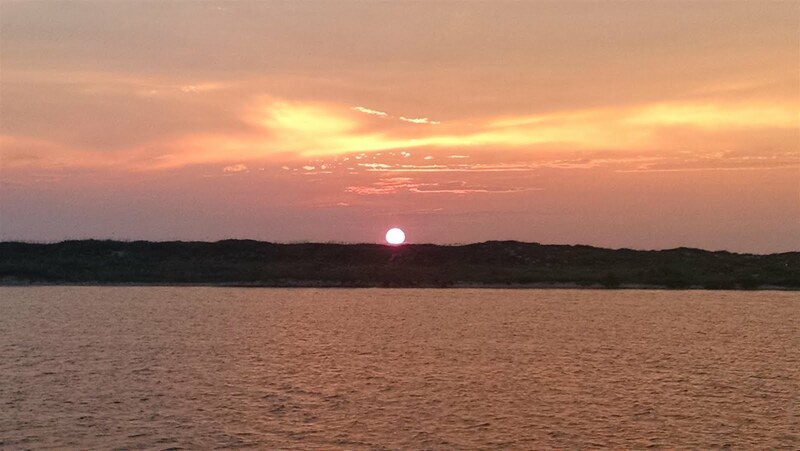 The Sunset at Our Anchorage at Cape Lookout. 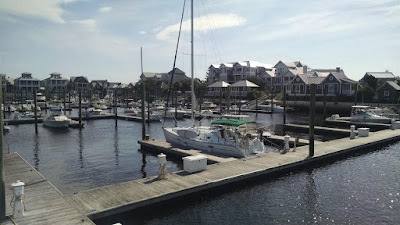 We were in no particular hurry the morning of Saturday, 11-August, as we only had a 17 mile sortie to our next destination, Jarret Bay Marina, located on the ICW just north of Beaufort, NC. 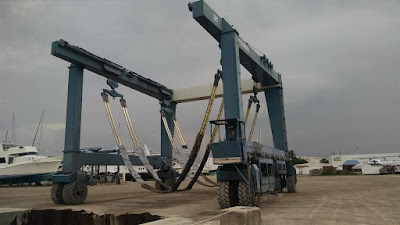 It has a reputation as an excellent boatyard with a ride range of services and parts, as well as some of the best pricing on diesel fuel, so we wanted to check it out. We pulled up the anchor just after high noon and headed Ghost Rider a few miles west towards the Beaufort Inlet….where the conditions turned out to be worse than boating in a washing machine. 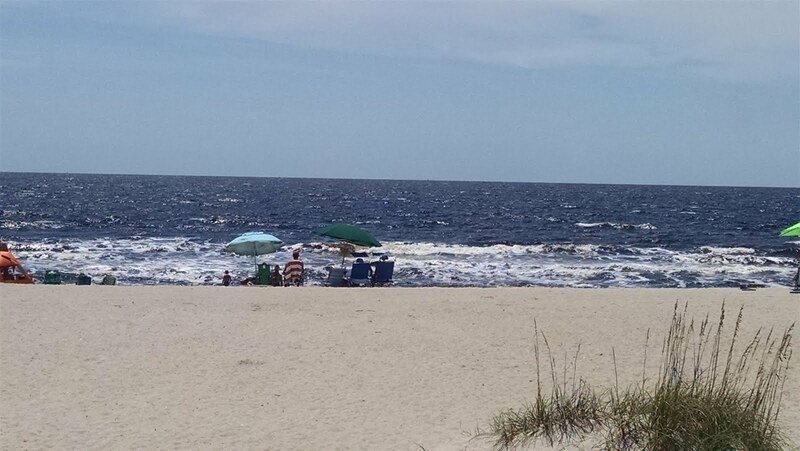 Winds had picked up from the SSW to around 20K with higher gusts, and when the resulting ocean swells collided into the swift outgoing current coming from the inlet, it created a confused, boiling mess. The autopilot does a lousy job keeping the boat pointed in the right direction in those conditions, so Rick applied some extra RPMs and hand steered the beast until we got inside the breakers. 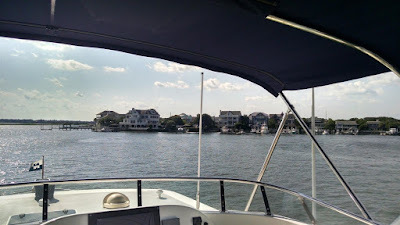 Then we joined the ICW and headed north in calmer waters. Highly Rated. And They Have Several Parts Stores On Site. Battling an outgoing current the entire way, we arrived at Jarret Bay just before 1500. We wanted to stop first at the fuel dock to take on diesel, but a large Marlow was hogging the pumps, so we just headed to the alongside floating dock. Chelle handled the helm duties today and did a fine job with the parallel parking. Bruce, the dockmaster, was on hand to help Rick with the lines, and within a few minutes later we were securely tied. Then we spent about two hours hosing off salt from every square inch of Ghost Rider’s exterior. Bruce came back by a couple hours later to check on us, offer Rick a golf cart ride to the parts store in the morning, and to let Chelle know he had a courtesy car available for her as well. Jarret Bay is by no means a picturesque place....it's in the middle of nearly nowhere and it is strictly a place you go for parts and/or service. Even its lone floating dock is unprotected from the nearby ICW boat traffic. But it's a good place to know and make contacts. 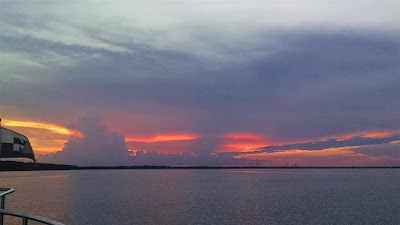 We heard thunder in the wee hours of the morning, but by sunrise on Sunday, 12-August the storms had passed, leaving a broken cloud cover and an abundance of humidity. Light showers would move in and out through the day, but there was nothing severe that threatened. In the morning we walked to the lone parts store that was open on Sunday and grabbed some minor hardware items, allowing Rick to replace a broken latching hook for the boat’s boarding door. That afternoon Chelle took advantage of the courtesy car to do some shopping, while Rick attacked the service that had come due on the generator – cleaning its air filter, and changing the oil and oil filter, along with the on-engine secondary fuel filter. By late afternoon all that was complete and Rick got to enjoy the final round of the PGA Championship on the big screen TV in the marina’s captain’s lounge. Monday, 13-August featured some more early morning rain, along with a few but very intermittent light showers during the day, so in reality was mostly dry in spite of the stifling humidity. Rick spent some time strolling the yard’s diesel parts stores that weren’t open over the weekend and was successful in locating a pencil zinc for the wing engine’s heat exchanger and a specialized 15 amp fuse assembly for the generator. In the afternoon we had a visit from Keith, the yard’s service manager. 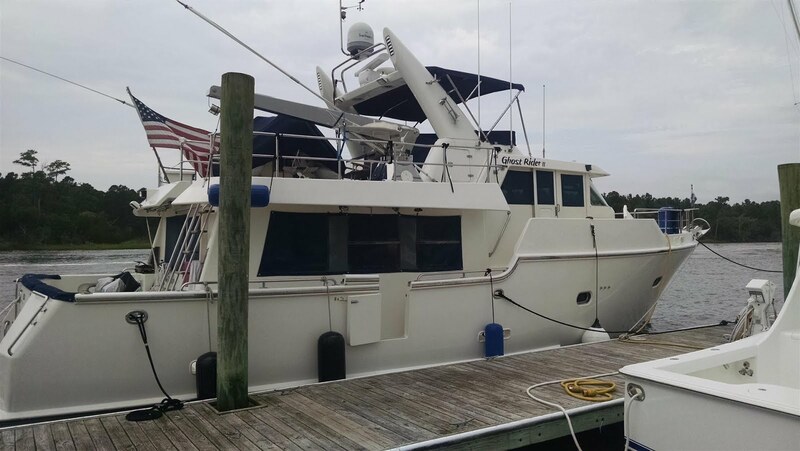 He was responding to our request for some service quotes – all future stuff on which we wanted to compare rates and fees; that included pricing for haul-out and bottom painting, as well as sanitary hose replacements and some potential cabinet doors to add to the galley’s pantry spaces. 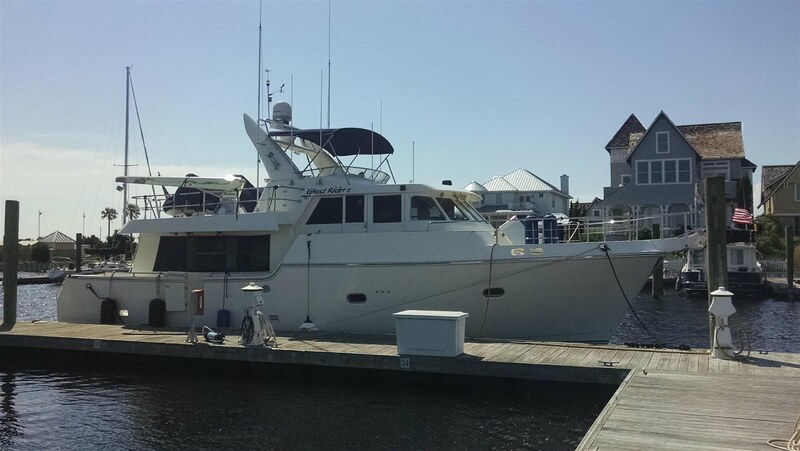 Ghost Rider Docked at Jarret Bay's Floating Dock. Rick also spent some time addressing two nuisance issues that we had recently encountered. The aforementioned 15 amp genset fuse had tripped a couple of times a few nights ago, and while we were able to reset it, we were pretty sure it was about to go south on us; that was a quick 5 minute replacement. And our ST60 relative wind instrument had gone on the fritz, with its directional needle stuck at the 12 o’clock position and wind speed just showing dashes; Rick examined the wiring at the gauge and anemometer (the latter requiring some interesting mast-climbing gymnastics) and that all checked out; the only thing left was to try a factory reset of the gauge….which worked until the next day. It's likely a failing head unit which can be dealt with later. Across the River. He Was On a Mission. The critter was making a beeline for the opposite shore and was on a certain collision course with Ghost Rider. Rick backed own hard on the throttle (we had a swift pushing current) while Chelle scrambled down from the fly bridge to the pilot house to start the wing engine and hydraulics – in case we needed to thrust the boat sideways to keep the prop away from the dog and us off the shoreline. 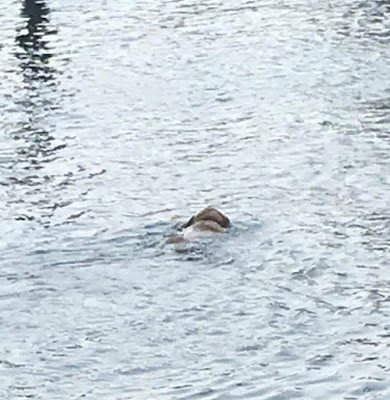 It looked to be an adult Labrador Retriever….he crossed just in front of us,from port to starboard, and eventually made it to the eastern shore of the river. We don’t think that one is covered in the right-of-way rules, but we were happy with our improvisation. 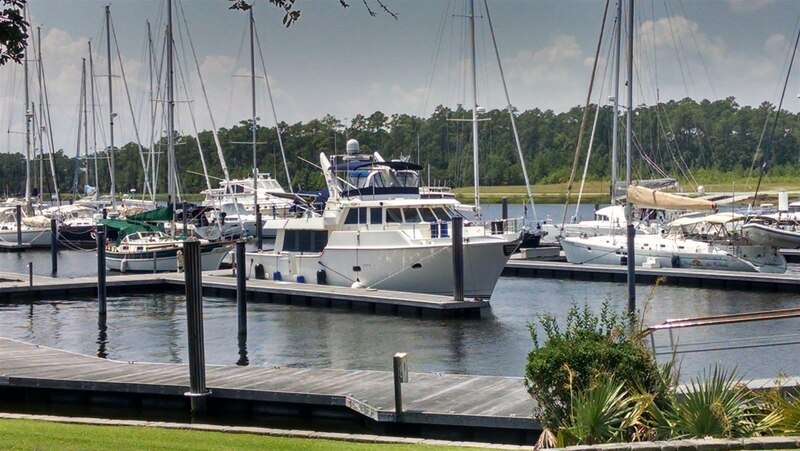 Shortly after that we spotted another Nordhavn cruising down river towards us; we had been expecting to see Mike and Mari aboard Mari Me, as they were bringing their N47 down to Jarret Bay (from River Dunes) for some service. We exchanged greetings on the VHF and planned a get-together for later in the week when they would return to their home port. 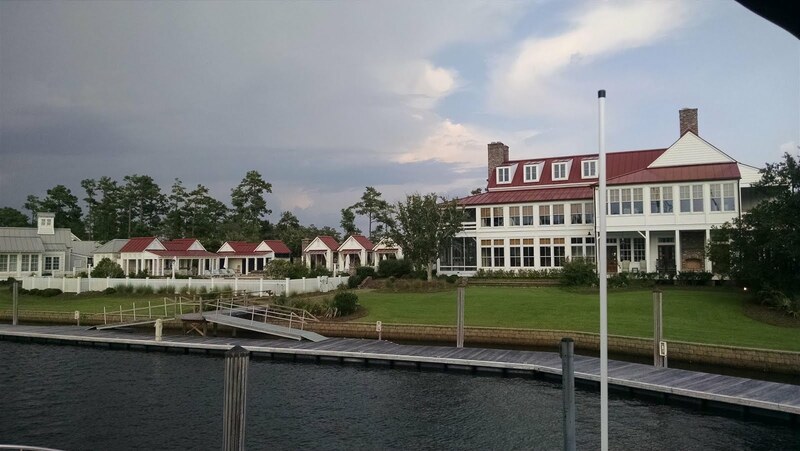 At River Dunes Marina....Clubhouse, Restaurant & Cottages. The remainder of the short cruise to River Dunes was pleasant and uneventful and we entered the marina’s narrow entrance channel just before 1400. Chelle again handled the helm and docking duties, and did a perfect job of steering Ghost Rider in for a stern-in starboard side tie to our assigned slip at the spacious floating docks. A couple of energetic, young dock hands helped us tie up and also retrieved our packages from the marina office (we had been shipping things here for about a week) and a short time later we had the boat and ourselves cleaned up. A line of rather electric but fast moving storms moved through just after 1800, but we had already finished our chores and were settled comfortably in the salon for the evening. Following that Chelle used the car to do some shopping / provisioning, and then we had another relaxing evening at the docks and on the boat. 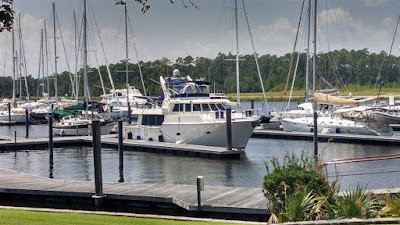 We're going to hang here for a couple more days to enjoy the marina, run some more errands, take care of some minor boat business (including a bottom cleaning), and visit with friends Mike & Mari when they return from Jarret Bay. After that we'll continue the journey north towards the Chesapeake. at Georgetown Light, Cape Fear, Cape Lookout and Jarret Bay Along the Way. 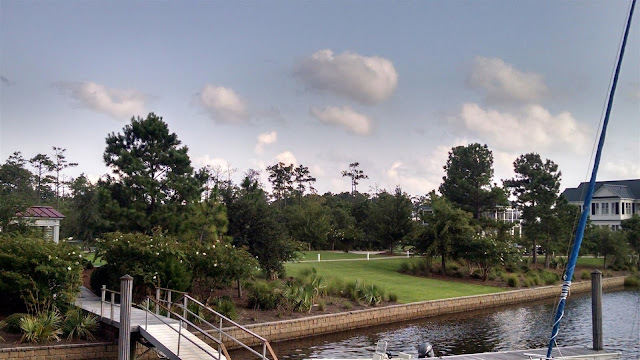 More of the Grounds at River Dunes Marina in Oriental, NC. 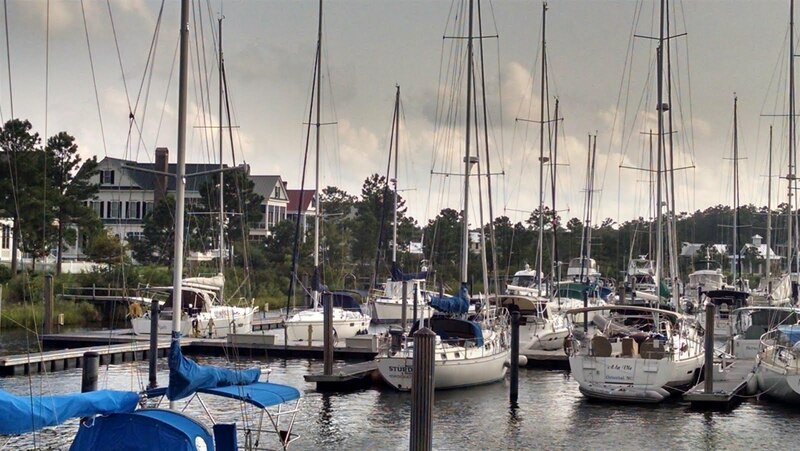 Another View at River Dunes Marina in Oriental, NC.